Over 20 years ago, I received my handy dandy Recipes for Youth Group Survival cookbook. Yes, as a junior and senior high youth director, my high school kids wanted to make sure I knew some of their favorite Desserts for Teens and to this day, I still pull out this little mini hand written cook book for my own kids. They’re wonderful recipes for learning to cook with kids because they’re easy, but tried and true. 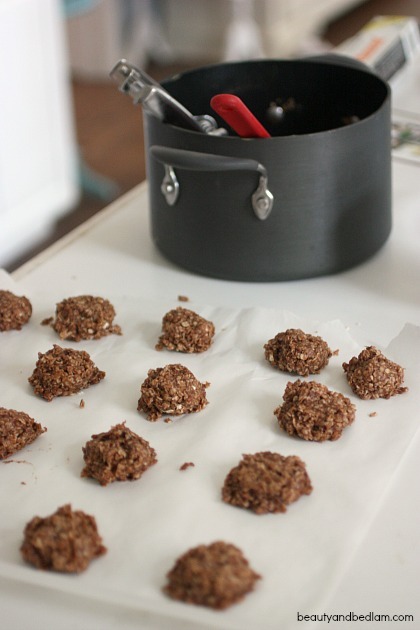 This No Bake Chocolate, Peanut Butter Oatmeal Cookies recipe is one we go to often. It might not be the prettiest cookie in the bunch, but its taste will remind you that you can not stop at one. While I’ve made these numerous times, this recipe now corresponds with one of those “panic” hospitality moments. Thinking nothing of it, I went on my merry way with our piles of mountainous clean laundry spread on the couch. WHAT IN THE WORLD? The head coach was coming to our home? Typically, I am a “Go with the flow” kind of girl, but having the head coach of your son’s future college football team come to your house without warning (clarification – my son knew and forgot to tell me) really does take the pressure up a notch. Especially since I’m not a “have everything in order at all times” kind of person. The scenario went something like this: me screaming in the nicest voice possible at our other children to grab all the laundry they can possibly muster and run it up stairs, shove everything on the sofas in the closet, hide the dishes in the sink and quickly get the butter melting for these No Bake Chocolate Peanut Butter Cookies. Yes, this whole story all comes back around to these cookies. Since they don’t need time in the oven, they should just be called the, “Save your bootie in a pinch” kind of recipe. Should I change the title? So go mix these up in minutes and think of me running frantically through our home. Then sit down, eat a plate full (because you won’t be able to stop at one) and be glad you made these just for fun. 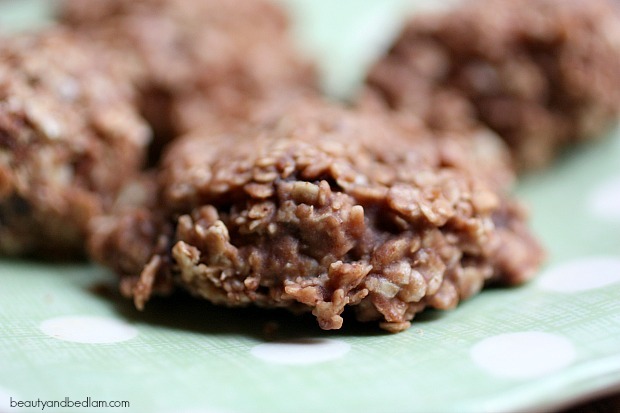 Summary: This decadent No Bake Chocolate Peanut Butter Oatmeal Cookie Recipe reminds you that you can’t just stop at one. Bring butter, sugar, milk and cocoa to rolling boil for one minute, stir often. 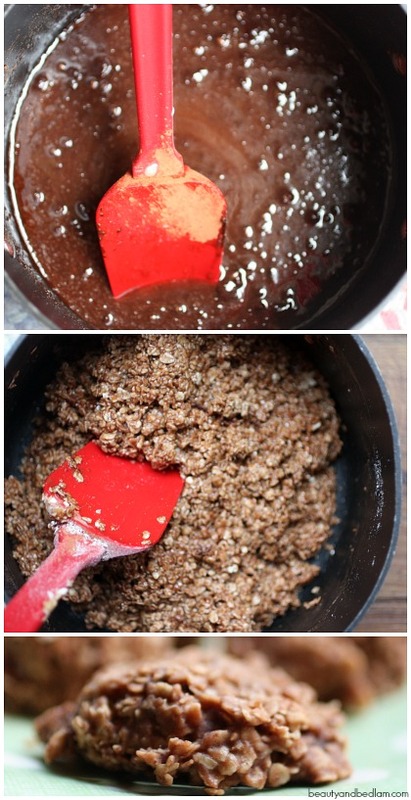 Mix in peanut butter and allow to melt, then stir in oatmeal. Drop tablespoon size of mixture onto wax paper and allow to cool and harden. Does this really make 8??? 4 cups of oatmeal for 8 cookies? Yay! 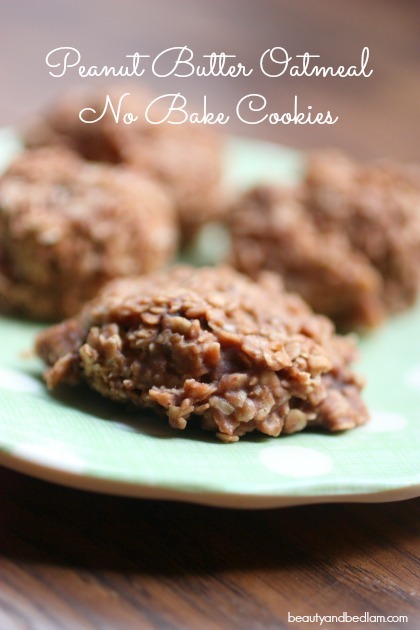 I grew up on these No Bake Cookies! I can make a batch in less than 15 minutes. Now, after moving to near Denver, I’ve had several people tell me they’d never had one before, but loved them. So glad to be helping the masses! My recipe is similar, but with very different measurements, shredded coconut (no one ever notices though, so I’m not sure it makes a difference) and vanilla. BUT these cookies are amazing and like you said, I don’t know anyone who eats just one. They have become my staple cookie because they are so easy to mix up at the last minute. I have NEVER taken them anywhere and had some left to take home after the event. There is always an empty plate. oh yes, coconut and vanilla are great additions. I’ve added vanilla before and it’s a great twist. Love the coconut idea. We love these! My boys (15 and 12) made a batch two nights ago. They would have finished them off in less than 24 hours had I not intervened. If you’ve never had them – you must make them! This might be a silly question, but do you use old fashioned oats or instant? These are my husband’s specialty 🙂 We’ve discovered that, as delicious as the cookies are, it’s even more delicious if you spoon the warm cookie-mixture over vanilla ice cream and let it harden just a bit! My 15yo son has been making these for a couple of years now and they are AMAZING! One of our most favorite cookies. We usually triple batch these and the kids love to take them to school with their lunch. I got this receipe from a dear friends mother back in the 60’s. We called them KAREN’s Cookies because her mother had no idea where the receipe came from or how long she had made them. Always made them for my children. Thank you so much for sharing, I lost the receipe years ago.